Deoria Tal Lake is Paradise on Earth With Heavily Wooded, Lush Green Surroundings And Snow-Covered Mountains as Backdrop. Deoria Tal in Uttarakhand is of the best and perhaps the easiest trek in the Himalayas. Except on the second day of your trek, when you cover 8km which requires good stamina if you choose to couple that trek with a climb to Tungnath and Chandrashila. It is a steep climb and requires a certain determination and metal preparation. But honestly, it’s worth the effort – the visuals are breathtakingly stunning from up there. This trek is primarily for beginners who want an introduction to trekking in the Himalayas. It’s also for seasoned trekkers who wish to take a leisurely trek. Deoria Tal is known for its trek through thick forests; if you take the section between Deoria Tal Lake and Bhrujgali Camp, the variety of jungles is unimaginable. This trek flourishes with blossoms of all kinds, especially red and pink rhododendrons in summer. You can be a nature lover, a birder or a shutterbug – the Deoria Tal trek is for everybody. Situated at an altitude of 7, 800 feet, the lake is surrounded with forests on all sides. 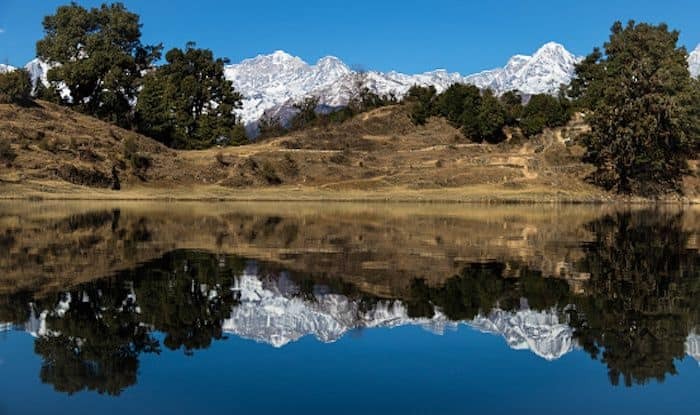 At a short distance ahead, the Chaukhamba mountain glistens and the reflection of it is caught in the crystal-like waters of the lake. Legend goes that the five pandava brothers from Mahabharata were once thirsty and had come to the waters of Deoria Tal and faced a test of wisdom at the exact same spot as the lake. Camping here under the stars is one of the best memories to make while on a trek here. The major attractions that you’ll come across on your way are Bandarpunch, Kedar and Chaukhamba to name a few. These stellar peaks in Garhwal Himalayas motivate you to go on until the end of the summit stretch at Tungnath Temple at Chandrashila.